I love this scarf because its pattern is very flexible. Colors, length and width can be adjusted to match your style. 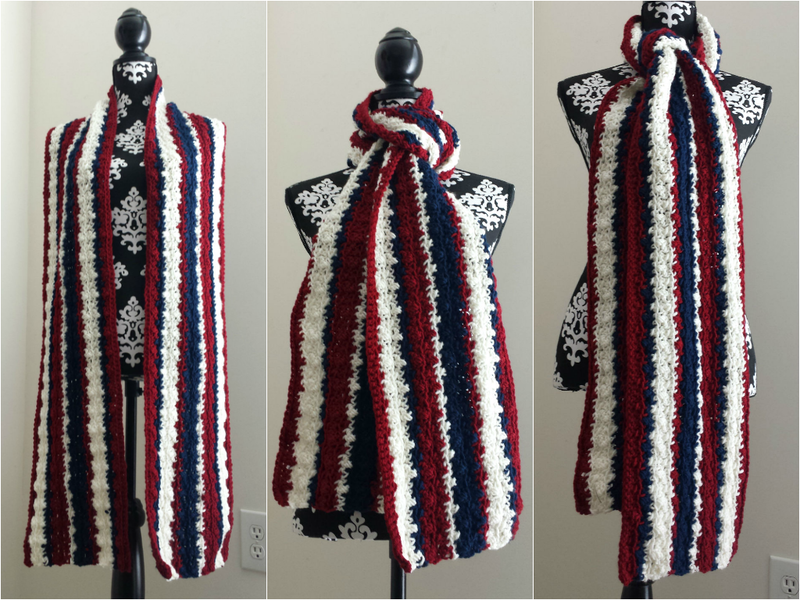 In this tutorial, I’ll show you what I did and the final measurements of my scarf. TIP: Start with the color you want to stand out most as it will show up most throughout the scarf. The 2nd color should be the one you want to show up the least. My color order is dark red, navy then cream. Chain any multiple of 6 plus 5 in COLOR 1 using the I hook. I chained 245. Turn. Switch to your H hook. In the second chain from the hook, single crochet in each chain across. Chain 1 and turn. 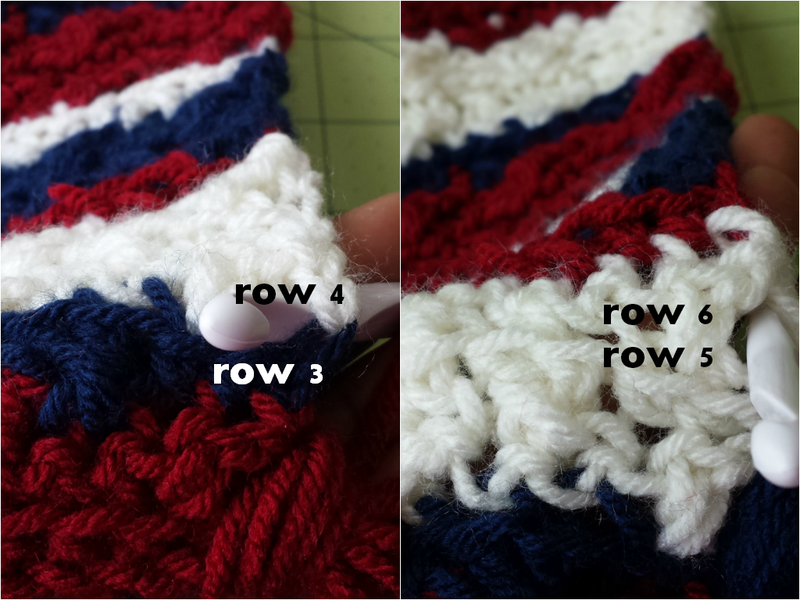 The single crochet row counts as ROW 1, NOT the chain stitch row. Crochet 1 single crochet in the first single crochet. *Skip the next single crochet, 1 double crochet in next single crochet, 1 doubled crochet in skipped single crochet, 1 single in each of the next 2 single crochet. Repeat from the * until you reach the end ending with 1 single crochet in last single crochet. Before you pull the last yarn over through the loop to finish your single crochet, prepare to change to COLOR 2. Insert beginning loop of COLOR 2 at the end of the hook. Pull the loop through. Chain 2 and turn. This finishes ROW 2. Leaving a tail of about 2-3 inches, cut COLOR 1 yarn. 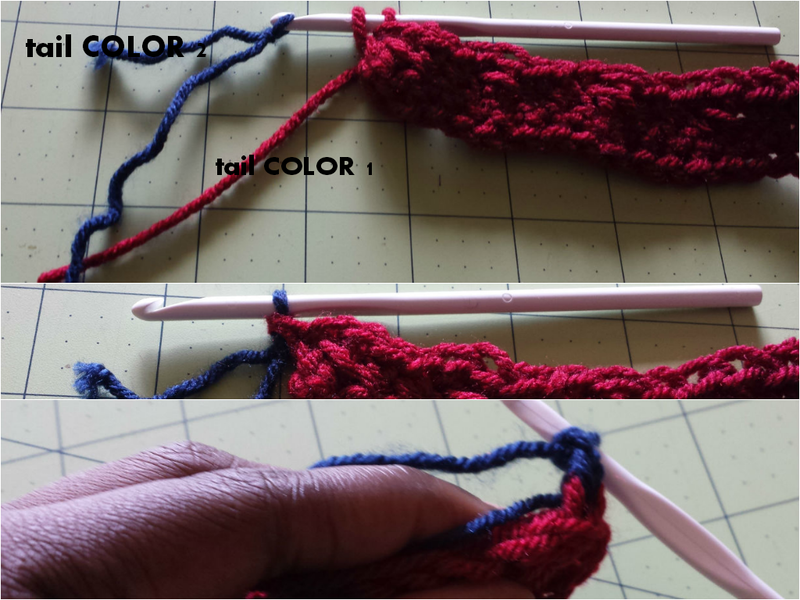 Begin ROW 3 by holding the tails of COLOR 1 and COLOR 2 closest to you in the hand holding your scarf. When you insert your hook into a loop in order to begin the next stitch, make sure you catch the tails of yarn. 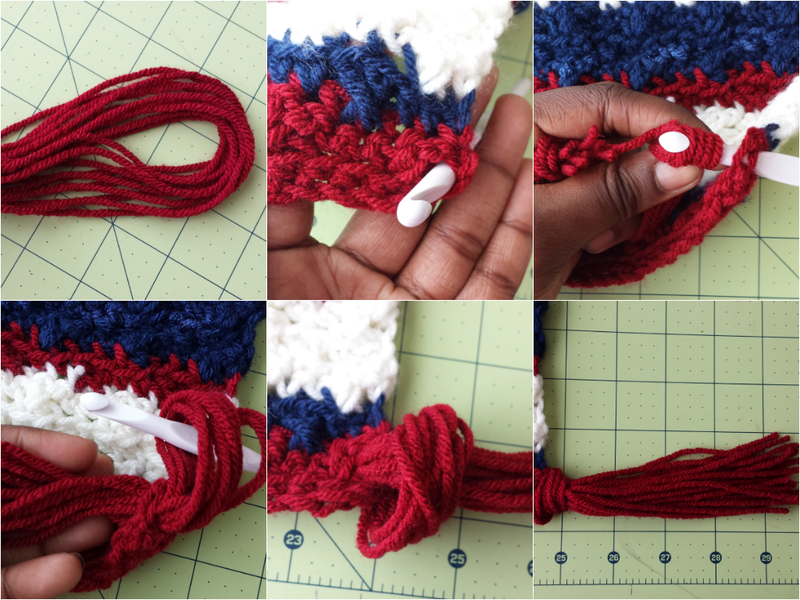 This hides the tails and keeps the edges of your scarf neat and clean. This is especially helpful if you opt not to do fringes. 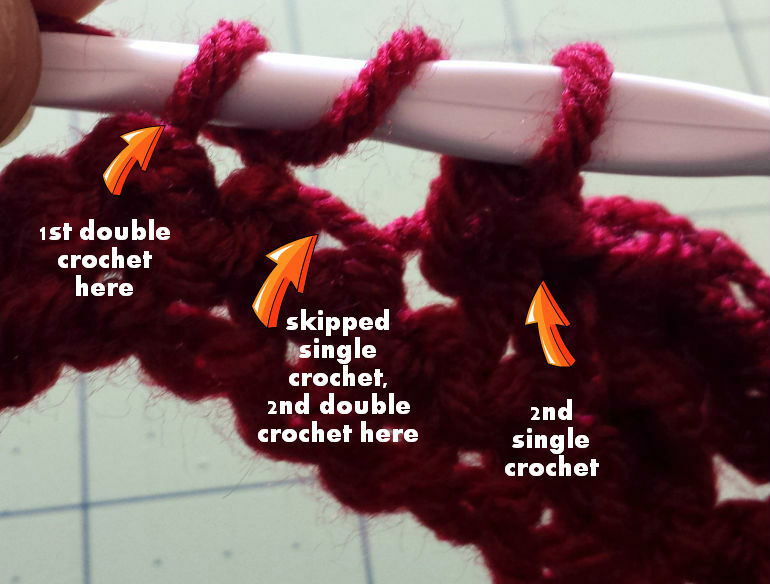 Skip the 1st single crochet, 1 single crochet in the next two double crochet, *skip 1 single crochet, double crochet in the next single crochet, double crochet in the skipped single crochet, single crochet in the next two double crochets. Repeat from the * until the end, ending in 1 double crochet in last single crochet. Before you pull the last yarn over through the loop, do as you did to change to COLOR 2 to change to COLOR 3. Chain 1 and turn. ROW 4 begins with COLOR 3. 1 single crochet in first double crochet, skip next single crochet, 1 double crochet in next single crochet, 1 double crochet in skipped single crochet, *1 single crochet in next two double crochet, skip 1 single crochet, 1 double crochet in next single crochet, 1 double crochet in skipped single crochet. 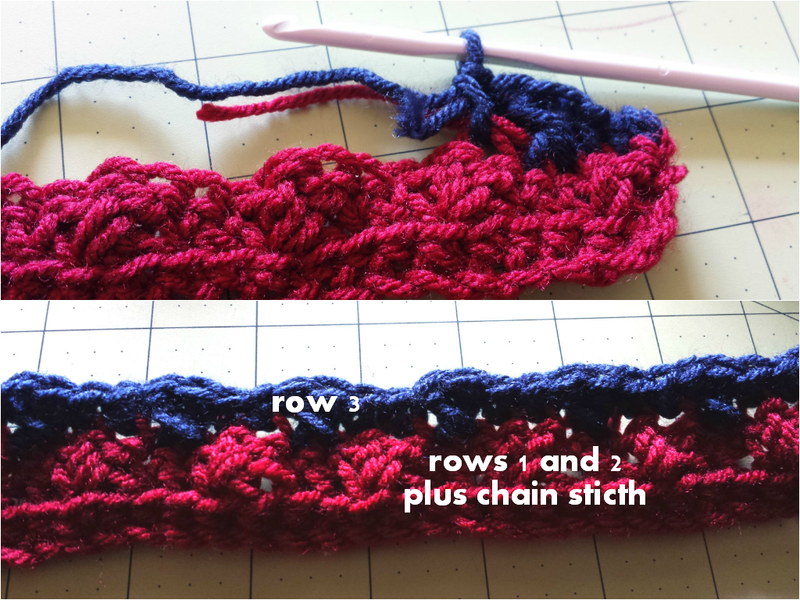 Repeat from the * to end ending with 1 single crochet in the top of the turning chain. Chain two and turn. For the next two rows of COLOR 3, repeat the pattern for ROW 3 (ROW 2 out of 3 for COLOR 3) and ROW 4 (ROW 3 of 3 for COLOR 3). 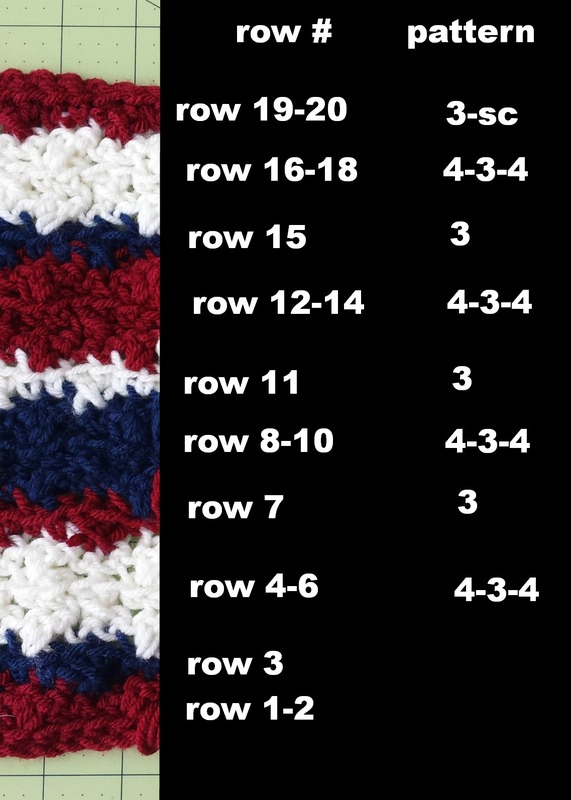 ROW 3 and ROW 4 repeat throughout the scarf, alternating the colors as shown. 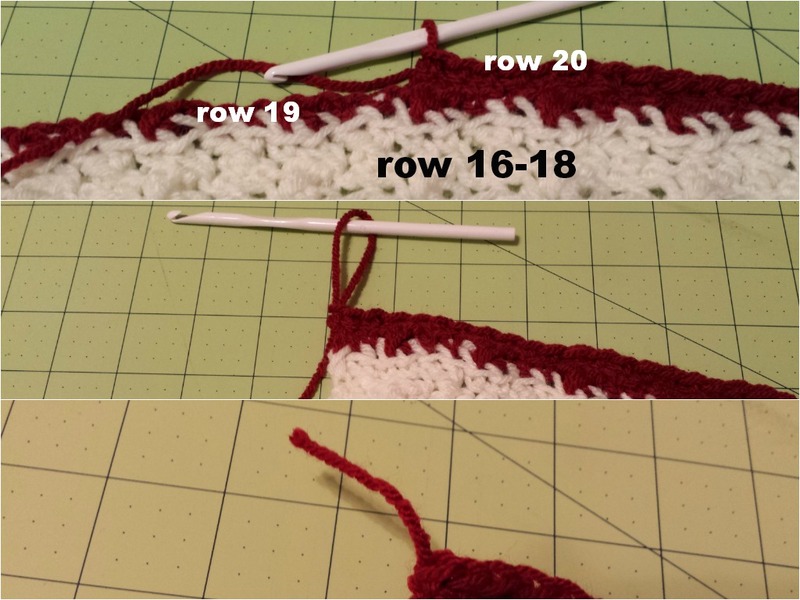 For ROW 20, simply single crochet in 2nd single crochet and in each stitch across. 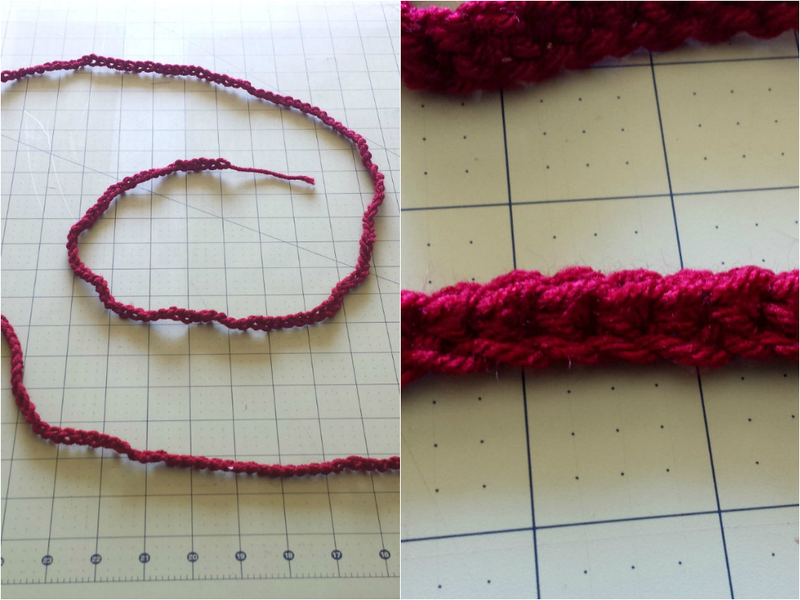 After pulling up the loop that finished the last single crochet, cut the loop in half then pull the yarn through. Leave about a 2-3 inch tail. To hide the tail, insert your hook through the edge of ROW 19 and ROW 20. Yarn over using the tail and pull all the way through. 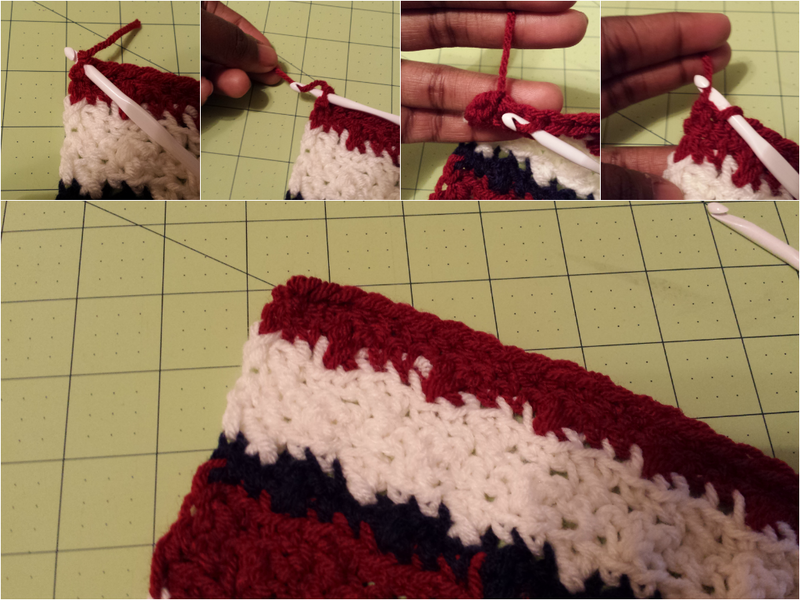 Insert your hook into 1 side of the second single crochet from edge, yarn over and pull the tail all the way through. Repeat until the tail is completely hidden. J (6.50mm) crochet hook. 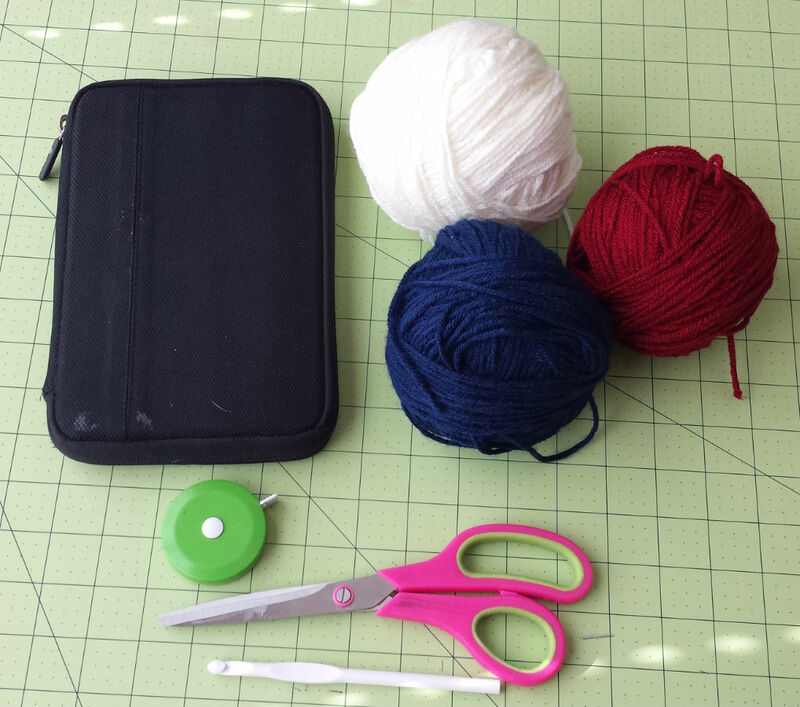 The larger hook makes it easier to grab the yarn for the fringes. 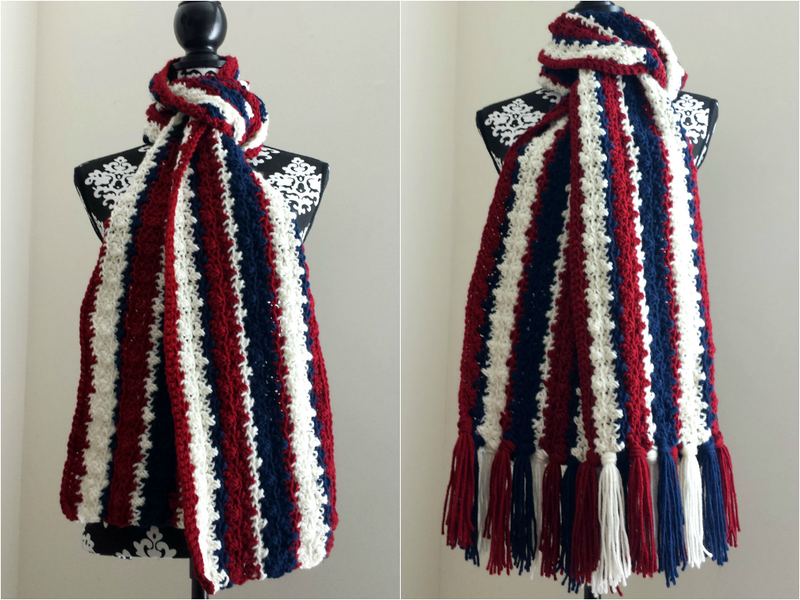 Something that’s 2x plus 1 inch as wide you want your finished fringe to be long. 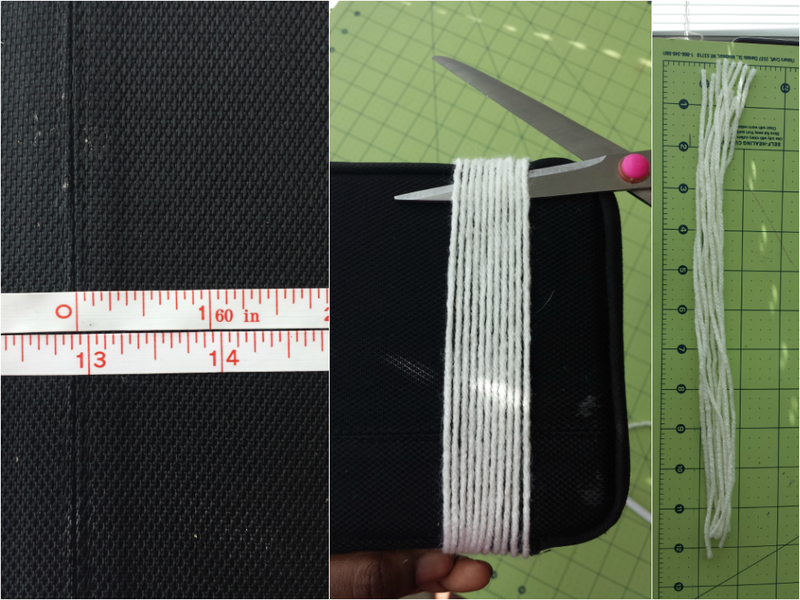 My finished fringe will be about 6 inches long so I’m using my tablet case as my guide. 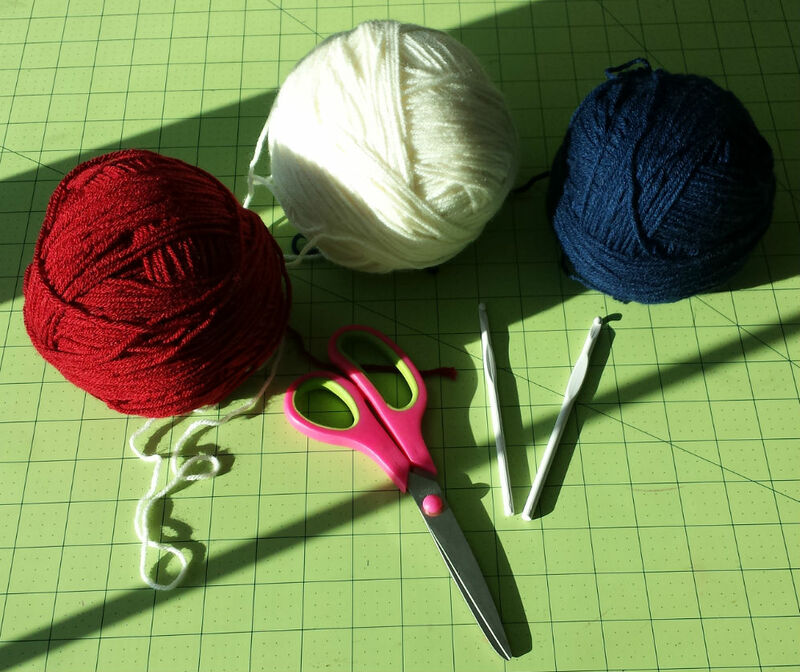 Wrap the yarn around your object a few times (try not to do it too tightly), then cut towards the top. You should be left with pieces of yarn about twice as wide as you want your fringe to be. That extra inch accounts for two things. The first is here. When you wrap your yarn around it’s going to stretch a bit. I used the cream yarn here just for contrast purposes so you can better see what I’m doing, but I started with COLOR 1. You need 10 pieces of yarn for each fringe. I like to wrap and cut about 3 times for each color just to get me started. Once you’ve got 10 pieces separated, form a horseshoe. Working with the bottom right of ROW 1, insert your J hook into the edge of ROW 1 and ROW 2 from behind. Hook the closed end of the horseshoe on your hook. Pull through the edge, but not all the way. The loop should be big enough to pull the open end of the horseshoe through. This is part two of what the extra inch accounts for. Tighten the edge just enough as shown. 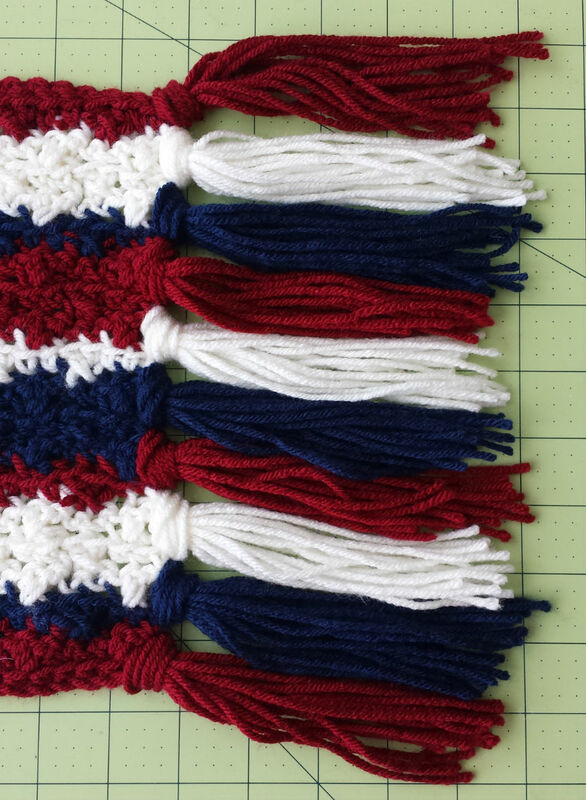 To do the fringe for COLOR 2, insert your hook in the edge of ROW 3 and ROW 4. There will be a bit of an overlap, but when the fringe of COLOR 3 is inserted on the edge of ROW 5 and ROW 6 it evens up. I suggest going in color order to keep a consistent edge. Keep going all the way up the edge, doing the same on the other side. You can trim the edge to make them perfectly even, or you can leave it as so for a more organic feel. A whole new look! I think the fringe makes it look more fun. The new dimensions are about 9″W by 116″L. Chain a multiple of 6 plus 5 in COLOR 1. ROW 1: Crochet 1 SC in 2nd chain from hook and in each chain until the end. Chain 1 and turn. 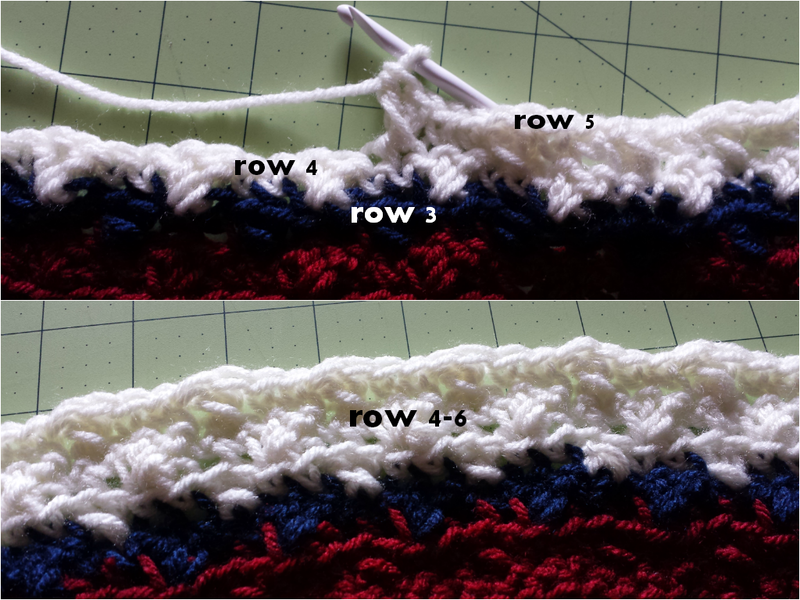 ROW 2: Crochet 1 SC in the 1st SC, *skip 1 SC, 1 DC in next SC, 1 DC in skipped DC, 1 SC in each of next two SC. Repeat from * to the end, ending with 1 SC in last SC. Chain 2 and turn. Change to COLOR 2. ROW 3: Skip first SC, 1 SC in each of the next 2 DC, *skip 1 SC, 1 DC in the next SC, 1 DC in skipped SC, 1 SC in each of next 2 DC. Repeat from * ending 1 DC in last SC. Chain 1 and turn. Change to COLOR 2. ROW 4: 1 SC in first DC, skip next SC, 1 DC in next SC, 1 DC in skipped SC. *1 SC in each of the next 2 DC, skip 1 SC, 1 DC in next SC, 1 DC in skipped SC. Repeat from * until end, ending with 1 SC in the top of the turning chain. Chain 2 and turn. ROW 5-6: Repeat ROW 3 and ROW 4. Change to COLOR 1. ROW 7: Repeat ROW 3. Change to COLOR 2. ROW 8-10: Repeat ROW 4, 3, 4. Change to COLOR 3. ROW 11: Repeat ROW 3. Change to COLOR 1. ROW 12-14: Repeat ROW 4, 3, 4. Change to COLOR 2. ROW 15: Repeat ROW 3. Change to COLOR 3. ROW 16-18: Repeat ROW 4, 3, 4. Change to COLOR 1. ROW 19: Repeat ROW 3. ROW 20: SC in 2nd chain and in each chain across. I hope this tutorial was very helpful. I tried to be as detailed as I could. If you have any questions don’t hesitate to contact me. Once you’ve finished your scarf I would love to see pictures! Post them to my Facebook page Emerald Lily Craft Studio or tag me on Twitter and Instagram @EmeraldLilyCS. 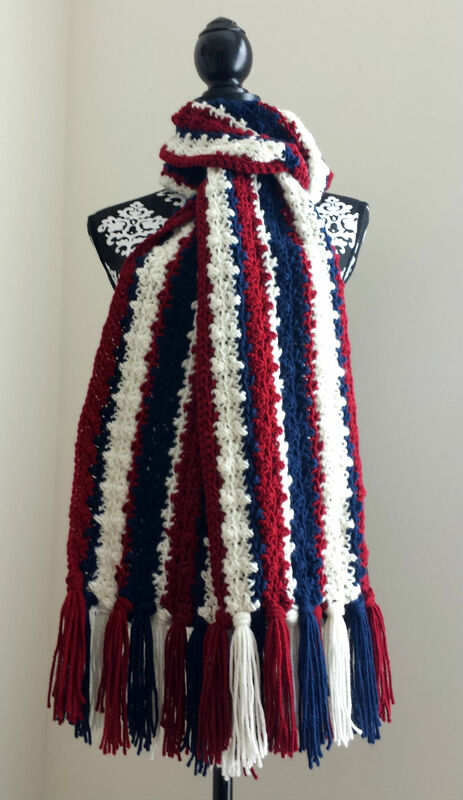 This entry was posted in Clothing and tagged clothing, cold weather, COLOR, crochet, scarf, style, winter. Bookmark the permalink.